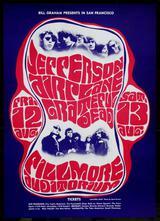 Art by Wes Wilson with the Dead photo by Herb Greene (JA photo is uncredited), image is # 23 in the Bill Graham/Fillmore series. Medium-thin flat stock poster is in excellent (A-/B+) condition; a small amount of edge/corner wear (slight bending), otherwise very sharp indeed. A classic.